It’s hard to believe my favorite holiday is right around the corner. The Fourth of July marks the adoption of the Declaration of Independence and is usually celebrated with fireworks and BBQs. It is pretty remarkable to think about what things would be like if we hadn’t declared our independence from Britain. In addition to enjoying the long weekend, it’s a great time to look back on history and appreciate our independence and liberties. There are several historic sites in Philadelphia where you can do just that. Remember, Philly was the first capital of our country and is the home to Independence Hall and the Liberty Bell. 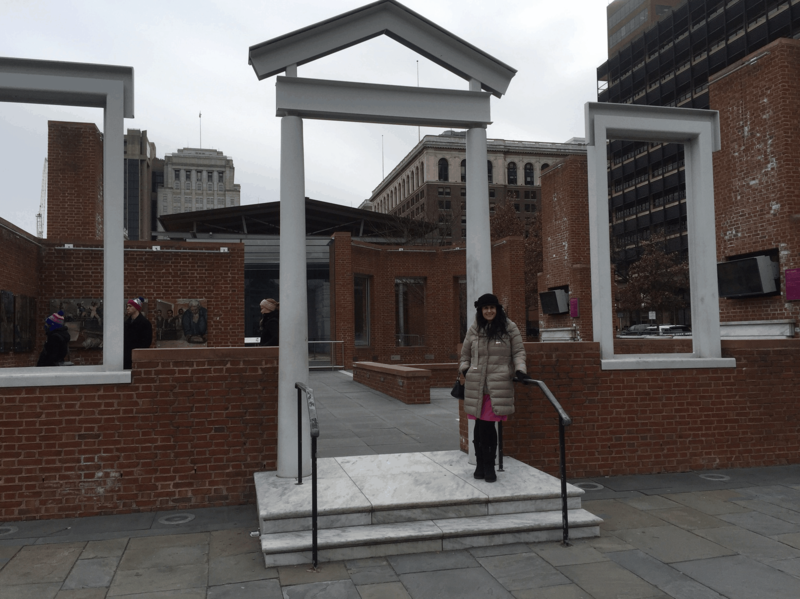 Let me tell you more about some of the most important tourist attractions in Philadelphia and share some tips for your visit. Note: This post contains affiliate links. Please see the disclosure below for more information. I have been to Philadelphia a few times before for work, but never had time to explore. So we decided to visit Philly back in February for President’s Day weekend, which turned out to be bitterly cold. That was fine though because we planned on spending most of our time inside appreciating the history (more about the art we saw in a later post). It wasn’t the best time to visit Philadelphia. We would need to come back another time when the weather was better to see more of the outdoor sites. Independence Hall looks just like I would have pictured it back in Revolutionary time. 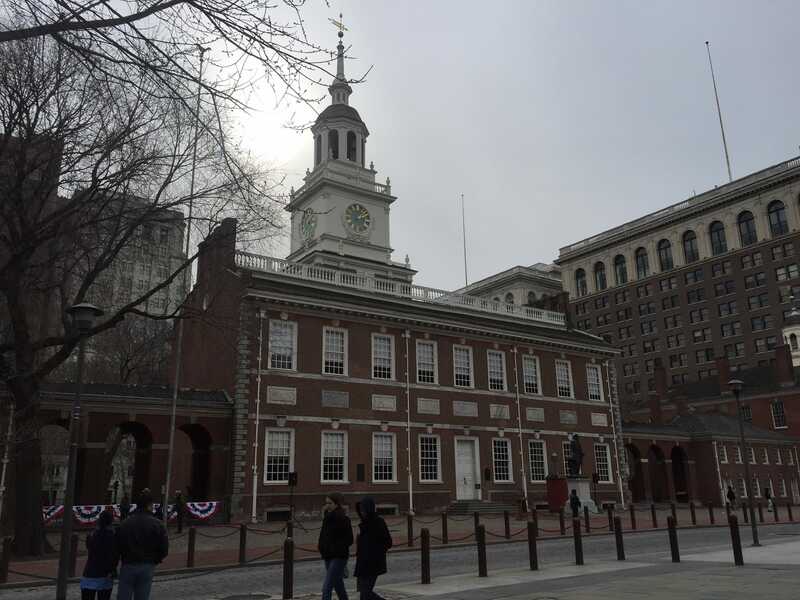 Our first stop was Independence Hall, centrally located in downtown Philadelphia. It’s been a while since I studied American History, so I was a little foggy on some details, but I do remember having to memorize and recite the Preamble to the Declaration of Independence and Constitution. I knew the Declaration of Independence and the Constitution were signed here and that is reason enough to visit. It is also one of the few UNESCO World Heritage sites in the United States. Usually, you can only see Independence Hall on a guided tour and you need to get the ticket in advance. Same day tickets are free and can be picked up at the Independence Day Visitor Center. You can also make a reservation online for a $1.50 handling fee. However, in January or February, you do not need any tickets. 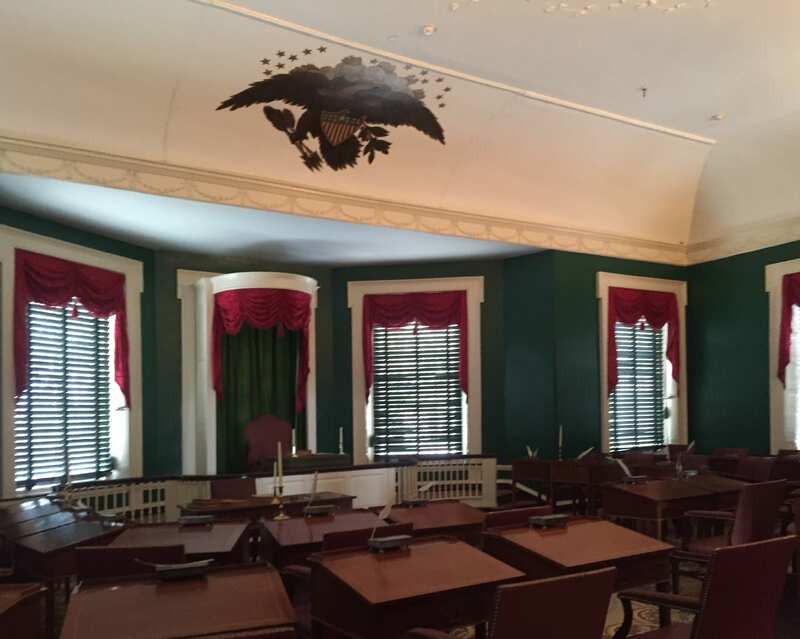 Inside Independence Hall you feel like you have gone back in time. We took a few pictures of the building before we went inside. They have done a great job preserving the building, it looks exactly like I would imagine it looked like back in the day. You do have to go through airport-style security once you enter. Since it was so quiet, we did not have a guided tour. Instead, we explored on our own. There were Park Rangers in each room that were happy to tell you the history and answer any questions you might have. 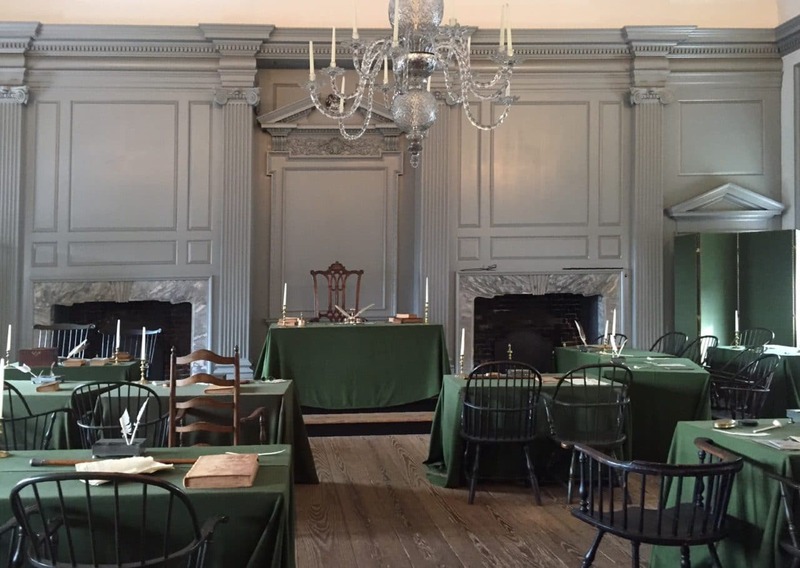 Just think about all the heroes that have been inside Independence Hall. Each room was set like it was during the Revolutionary time. It was moving being in the place where the Declaration of Independence was signed if you think about how different things would be without it. I also enjoyed seeing the Senate and Committee rooms upstairs. There were several pieces of impressive artwork. I expected to see the Liberty Bell at Independence Hall, but it is actually located in a separate building across the street, which opened in 2003. No ticket is required (i.e. it is free) but you may have to wait in line to go in (there is security and they don’t want it too crowded). Also, you will pass through the ruins of the first President’s House to get to the entrance. The Liberty Bell exhibit was not very big, so an hour is plenty of time to see it. I liked the way it was set up, the Liberty Bell is nicely featured. You can see it from outside through a window. From inside the exhibit, when you look at the bell, you see Independence Hall in the background. There are just ruins left of the President’s House. I didn’t know much about the Liberty Bell beside its iconic crack. It is rumored that the bell rang to summon everyone to hear the first reading of the Declaration of Independence, but no one knows how it was cracked. I knew the Liberty Bell was symbolic but I don’t think I got it until this exhibit. The crack in the Liberty Bell shows that even something that appears strong and durable can be fragile and easily damaged. The same goes for Liberty. 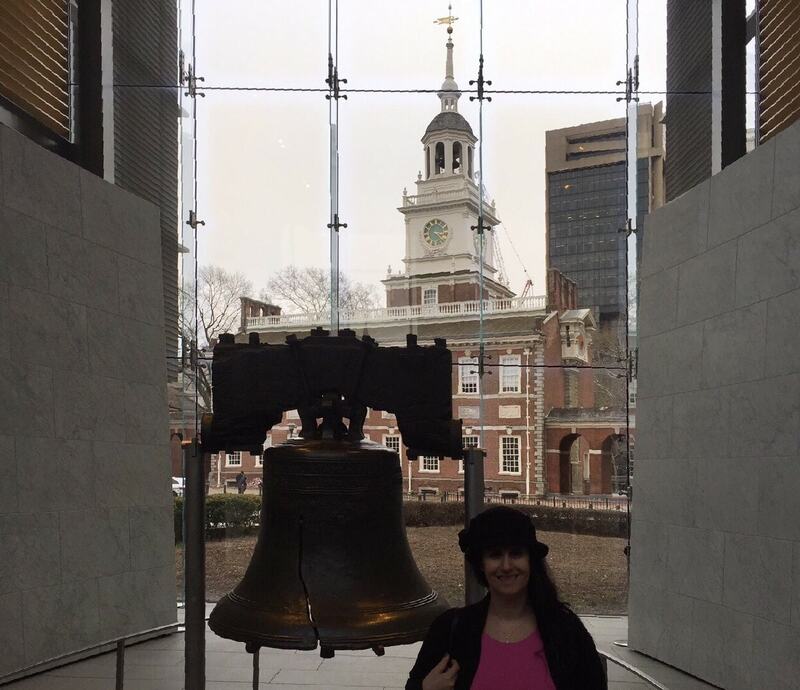 Anisa with the Liberty Bell and Independence Hall in the background. I also had no idea that the Liberty Bell was a symbol used in the fight against slavery and also for Women’s rights. It was so popular the Liberty Bell actually went out on a national tour. Also, the Justice Bell was created as a replica of the Liberty Bell to symbolize the fight for women’s right to vote. The clapper of the Justice Bell was chained to the side so that it could not be rung before women had the right to vote. The Justice Bell also went on tour but now resides not too far away at Valley Forge National Historical Park. So while you are enjoying your Fourth of July weekend, remember how precious liberty is and be thankful. What other historical sites you visited? I would love to hear more about it in the comments. Both Independence Hall and the Liberty Bell are free to visit. For Independence Hall from March – December, you need to pick up a ticket at the Visitor Center the same day. You can easily see the two top historical sites in Philadelphia in an afternoon. Disclosure: This post also contains affiliate links. This means we will receive a small commission for some purchases made using links in our blog with no additional cost to you. Please be assured we would not promote any product unless we believe that our readers will also benefit. The commission does not influence the editorial content of this site. PreviousFun Times Biking in Central Park + A Discount Code! It’s been a while, but road trips to philly were always fun. If you get toPitt, be sure and eat at the Doorstop. Tell them Ken and Kevin sent you. Thanks for the tip. Will check it out next time. That’s so interesting! When I was last in PA, I visited Getttysburg and thought about Philly (for those reasons you mentioned above) but simply had no time! I love these places with so much history although it also really brings home how much things have changed in the last century. Have you been to Colonial Williamsburg? That was highly enjoyable and memorable as well! I haven’t been to either of those, but both sound interesting. Will have to add them to my list. Thanks for the suggestions. I love Philly! These are all great places to visit. I’d add in Eastern State Penitentiary to the list – a very unique experience checking out a historic preserved prison. Lindsay – thanks for the suggestion, will definitely add the Eastern State Penitentiary to the list. I had not heard about that before. It seems like my kind of city. I’d love to visit the Independence Hall. There is so much history attached to it. Yes! I really enjoyed my weekend there, plan on going back soon to see more. Yes, I loved the Freedom Trail in Boston! Will have to check out that show. Thanks! Yes and I really enjoyed it. It would be worth going even if they charged admission. Like you, I’ve been several times but never done the ‘tourist’ thing. I must do that next time. Thanks! Haha yes the steps of the Philadelphia Museum of Art. More about that in an upcoming post. Wow,so glad you shared this on #TheWeeklyPostcard. It’s been ages since I’ve visited Philly and even longer since I last visited Independence Hall. (I was a kid.) You’ve inspired me to consider going back to do the history-tourist thing. Did you happen to have one of those famous Philadelphia cheese steaks while you were in town? Linda so glad you enjoyed it. No I did not have a cheesesteak. I want to go back for that and also the Constitution Museum.